Latest pics on the new arena. 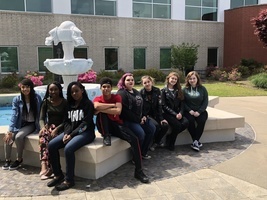 CHS student art on display at the National Art Educators Association’s YAM Museum at the national conference in Boston on March 14-16, 2019.Students who had artwork displayed were Elena Grimes, Yuri Guzman, Gage Davis, Luis Zelaya, Jada Jackson, Alexus Garrison, Lamaundre Nelson. Delano Miller. Please join EAST as they clean up Clarendon. 2nd Annual Alumni Dinner and Auction was a Huge Success! The Youth Art Month Awards Ceremony was held Saturday, March 30 at the Old Statehouse in Little Rock. Nickel Mason won fourth place in the Junior high division for her flag design. The art was on display at the Statehouse during the month of March in honor of National Youth Art Month. Pictured above are Mrs. McCoy, CHS Art Teacher, and Nicol Mason. Weekly gym progress for the week of March 25, 2019. Clarendon EAST Con team recently attended EAST conference in Hot Springs. EAST students presented their projects to judges and attended breakout sessions. Members are: Laura Loewer, Tyler Ford, Allison Vent, Markell Artis, Logan Johnson, Laci Johnson, Gabby Marcum and Ariel Jefferson. India Whitman, Brandy Cartwright, Kelise Harris and Laresha Walls helped Mrs. McCoy set up an art display at Merchants and Planters Bank in Clarendon to celebrate National Youth Art Month. The artwork will be on display throughout Spring break. CHS Alumnus, Broox Piggee, delivered the Welcome Speech at the University of Arkansas, Martin Luther King., Jr. vigil on Monday. Broox is the president of the U of A Black Alumni Scholar Society. Just a reminder that all Pee Wee players need to be at the high school gym by 6:00 p.m.
Clarendon School of Innovation will host EAST Night Out on Thursday, Jan. 24 from 5:30 p.m. to 7:00 p.m. in the high school auditorium. Financial Aid Night will also be during that time in the high school auditorium. 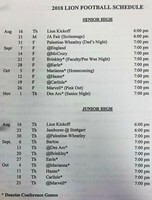 For more information please call the high school office at 870-747-3326. Congratulations to Nickol Mason, an 8th grade student at Clarendon School of Innovation. Nickol has won 4th place in the Youth Art Month Flag/Banner Design contest for the middle level. Her art will be shown in Little Rock at the Old Statehouse during March and there will be an awards ceremony for all the winners! Friday's Basketball Game against East Poinsett County has been changed to tomorrow. Jaleah Bones artwork “Butterfly “ was displayed at the first Arts Advocacy Day held at the State Capital November 7th. The artwork was then displayed at the Arkansas Department of Education for a week. We are proud that she represented the Eastern Region with her artwork! SRO and K9 Handler Deputy Caldwell received a Capitol Citation from Arkansas Secretary of State Mark Martin for her distinguished accomplishments, services, and deeds. First grade students at Clarendon Elementary School have spent the last quarter studying plant science. Students got to experience all of the stages of farming through planting, harvesting, and consuming. To end their plant science unit, they visited Peebles Farm to experience the planting/harvesting process of corn, cotton, and pumpkins! Syan Tyer, a senior at Clarendon High School, received 1st place in Oratorical Speech at the Arkansas Land & Community Development Corporation's 38th Annual Youth Conference in Fargo. Clarendon's Boo Bash will now be held on Tuesday, Oct. 30th at 5 p.m. in the Mid-Delta employee parking lot. Door to door trick or treating has also been changed to Tuesday. Clarendon Elementary School will host a Fall Festival on Saturday, Oct. 27 from 1:00 p.m. to 3:00 p.m. Haunted Hayride to be held on Oct. 27th and 31st. Our Alumni Dinner & Auction is set for March 30, 2019. Please make plans to attend. 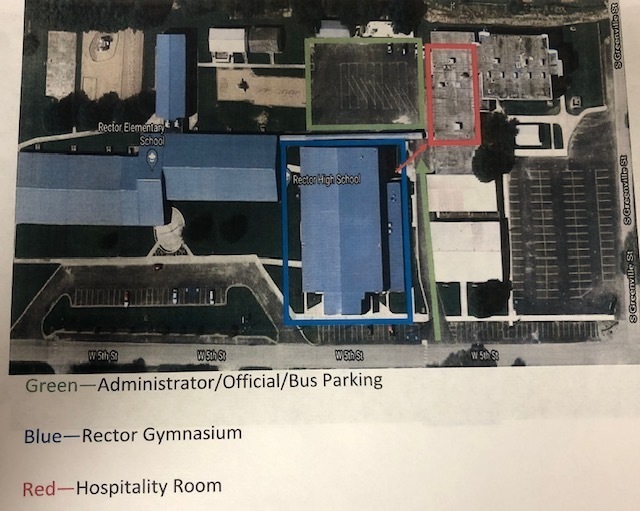 If you haven't filled out an alumni card with your current address please email that information to Keri Simpson at simpsonk@lions.grsc.k12.ar.us or messsage us on our Clarendon High School Facebook page so that you can be added to the mailing list. Clarendon School District's Annual Title 1 Meeting will be hold at 9 a.m. on Nov. 2 at the Clarendon Elementary Professional Development Room. Parents are encouraged to attend. Refreshments will be provided and there will be door prizes. Students at Clarendon Elementary School participate in Disney Day during Homecoming Week. 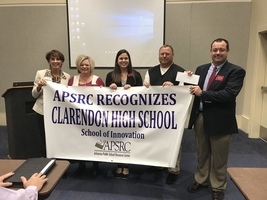 Laura Loewer, a senior at Clarendon High School, was recently announced as an AP Scholar after passing three AP end of year tests in AP Language, AP US History and AP Biology. She received college credit for each test. Laura has been accepted by the University of Arkansas at Fayetteville and plans to attend college there in the fall of 2019. 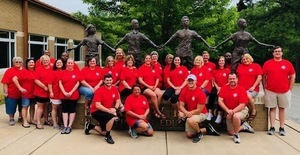 Allison Bobbitt and Laura Loewer attended EAST Student Training in Little Rock at EAST Initiative. During the sessions they learned about Photoshop and Storyboard programs. Sue Anne McCoy, CHS art teacher, will be honored at the Arkansas Art Educators Fall Conference Nov. 1 in Little Rock. She will be receiving the 2018 Service within the Profession Award. Mrs. McCoy has served on the AAE Council from 2007-2015 in 3 different positions and the AAE Board since 2014. She is currently serving as AAE Past –President through 2020. 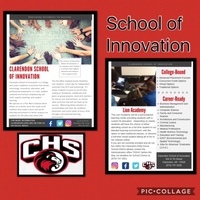 Ms. Welch and Mr. Simpson illustrate the CHS journey to innovation and next steps at the Office of Innovation Summit in Rogers, AR. Mayor Stinson recently signed a proclamation for National Suicide Prevention Awareness Month at Clarendon High School.This is one part of a community wide project on suicide prevention CHS EAST students will be working on throughout the month. Students from L to R: Eunice Guzman, Madison Middleton, Josh Bones, Tanner Stinnett, Tyler Ford. Clarendon High School is celebrating National Arts In Education Week, Sept. 10-14. Mayor Jim Stinson signed a proclamation proclaiming this week as National Arts in Education Week in Clarendon. Whit Caldwell, an 8th grade student at Clarendon High School, recently won first place at the Arkansas Junior High Rodeo Association Rodeo in Crossett. Whit competes in saddle bronc/steer riding across the state. Congratualtions to Whit from the Clarendon Holly Grove School District. Cody Simpson, a 7th grade student at CHS, was recently featured in the Arkansas Democrat Gazette. Cody is shown walking a horse to a stable at the State Fairgrounds in Little Rock. 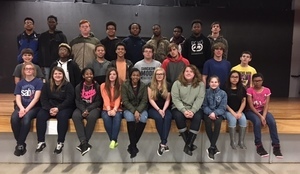 Students in the Clarendon School of Innovation Art Club recently joined over 1,000 students from around the state for the Young Arkansas Artist Conference and Competition. Students gathered in the Governor's Hall to hear the keynote speaker, Duane Hada. Hada is an Arkansas Wildlife Artist, well know for his watercolor fish and wildlife paintings. Students from Clarendon School of Innovation recently participated in Global Youth Service Day at the Clinton Library and the Arkansas Food Bank. 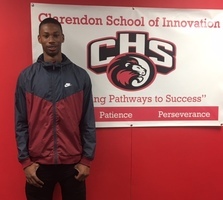 Congratulations to Malik Cartwright on being voted as one of the Top 5 Basketball Players in Class AA. Malik will attend a banquet on Thursday, April 19, in Benton that is hosted by Steve Sullivan, Sports Director of KATV. 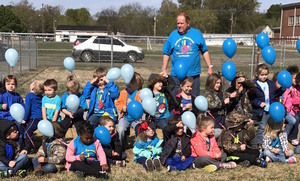 On Monday, April 9th Clarendon ABC Pre-K participated in the annual Autism Awareness balloon release. Tricia Rogers and her family donated balloons and presented the Pre-K with two classroom books. 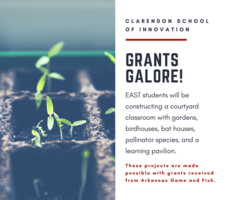 Clarendon School of Innovation has been awarded over $5000 in grant money from AR Game and Fish to construct a courtyard classroom designed by EAST students. 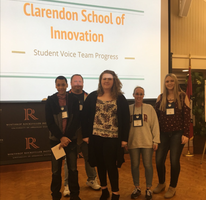 The Clarendon High School Student Voice Team (TJ Palmer, Chad Simpson, Laura Loewer, Susan Nosler, and Randi Harpole) recently completed their 4th session of the Student Voice Institute with the Arkansas Leadership Academy at the Winrock Institute on Petit Jean Mountain. 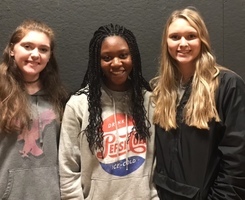 Clarendon High School of Innovation would like to congratulate Allison Bobbitt, Madison Middleton and Randi Harpole (pictured left to right) on making the Principal's Honor Roll. 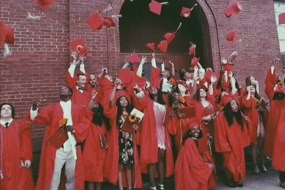 These students made all A's the first semester. 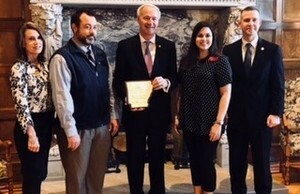 Clarendon School of Innovation received a start up grant from the Arkansas Department of Agriculture and was recognized during a ceremony with the Governor at the Capitol.